Maine has an incredible amount of fun and educational children’s activities across the state. From wildlife parks to museums to enjoying Maine’s traditional culture, you’ll easily find something for the kids to do that will inspire their minds for years to come. The Maine Wildlife Park in Gray is a wildlife rehabilitation center that is open to the public. It’s a perfect place for kids to see Maine’s native wildlife up close. You’ll see moose, white-tailed deer, black bears, bald eagles, and more. With tons of signage, games, and a summer kids program, you’ll children will beg you to return to learn more about the animals. Located in the heart of downtown Portland, the Children’s Museum of Maine offers three floors of exciting interactive exhibits and activities for children of all ages. Kids can explore things like a lobster boat, an interactive supermarket, and even a fire truck and farm. You can easily spend countless hours playing here. Most school aged children will visit the Maine State Museum in Augusta on a school field trip at some point, but the museum also makes a fun day out for the whole family. Explore Maine’s past, present, and future at the museum with many life-sized exhibits. The large museum features exhibitions on history, pre-history, and natural science. Open seasonally in West Boothbay Harbor, the Maine State Aquarium operated by the Maine Department of Marine Resources features a collection of fish and invertebrates native to Maine. The highlight of the aquarium is the lobster exhibition that features extraordinary lobsters of all sizes and colors. Children will love the 20-foot touch tank where they can feel the spiny skin of sea stars and sea urchins. The Wasburn-Norlands Living History Center is Maine’s oldest living history museum located in Livermore. As soon as you step onto the property you’ll step back in time to the 1800s. Discover life on a real Maine farm, such as cooking, washing, and tending the farm animals. Enjoy a simple tour or sign up for one of their special programs. Mackworth Island is a tiny island just over the river from Portland in Falmouth. The popular island is a legislated bird sanctuary and the former home to James Phinney Baxter and his son, Governor Percival Baxter. The flat trail is 1.25 miles around the island with stunning views of Casco Bay. Kids will love searching for and building their own fairy houses along the trail. A trip to the stars is as closer than you. Grab the kids and take in a show at the University of Southern Maine’s Southworth Planetarium in Portland. Opened Monday through Friday, the planetarium is home to a host of shows, classes, lectures, and First Friday Art Walk shows. Upcoming shows include Dinosaurs at Dusk, Extra solar Planets: Discovering New Worlds, and more. Experience life as a Maine lobsterman by joining the Coastal Lobster Tour with Rugosa Lobster Tours in charming Kennebunkport. 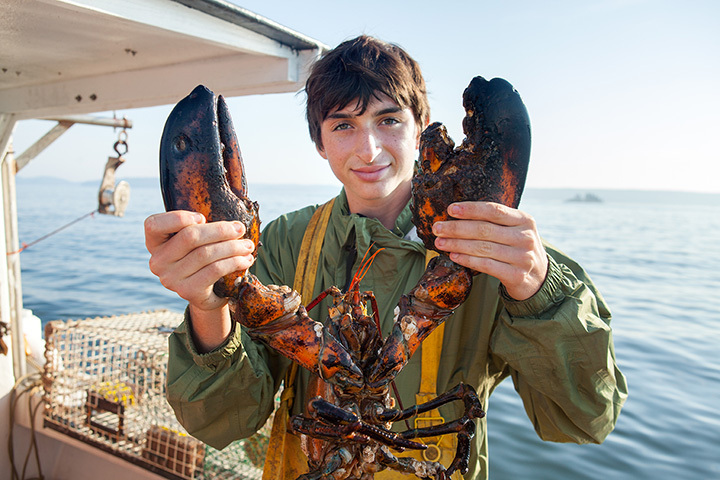 Hop on a classic New England lobster boat for a tour of the Kennebunk Rover and the coast. Kids and adults can roll up their sleeves and help haul in traps. Opened last year, the Portland Science Center is northern New England’s premier educational and entertainment center for the sciences. Situated on the Maine Wharf with over 15,000 square-feet of space, the Science Center hosts rotating exhibitions and shows. Currently the Center is home to the Dinosaurs Unearthed exhibition features a dozen animatronic dinosaurs, full-sized skeletons, fossils, and more. The Language Exchange in Portland is Maine’s premier immersion language school in the state for both adults and children. The school offers a range of private or semi-private tutoring for Mandarin, French, and Spanish and Spanish classes for children aged four to nine. Older children can join adult classes in a host of different languages.